A top physicist says the construction of a "factory" to produce Higgs boson particles is a priority for the science community. In an exclusive interview, Nigel Lockyer, head of America's premier particle physics lab, said studying the Higgs could hasten major discoveries. He said momentum in the physics community was gathering for a machine to be built either in Europe or Asia. "Our field uniformly agrees that would be a good thing," he told the BBC. The Fermilab director added: "The Higgs is such an interesting particle - a unique particle." The Higgs boson - named after British theoretical physicist Peter Higgs - was discovered in 2012 at the Large Hadron Collider (LHC) particle smasher under the Franco-Swiss border. The detection capped a decades-long effort to detect the particle experimentally, adding the last missing piece to the theory of particle physics known as the Standard Model, or SM. The SM explains how the building blocks of the Universe behave and interact, but physicists know it's just a stepping stone to a deeper understanding of the cosmos. For example, it doesn't provide an explanation for dark matter, dark energy or gravity. Physicists had hoped that the LHC would turn up evidence of physics phenomena not explained by the Standard Model. So far, efforts to detect new physics have come away empty-handed, but studying the Higgs in more detail might break the impasse. A successor to the Large Hadron Collider would be designed in a way that allows scientists to zero in on the Higgs boson. The LHC works by smashing beams of proton particles together, but the collisions that produce the Higgs also produce many other particles. This makes it complicated to work out which collisions produce the Higgs boson. A different type of particle smasher, called an electron-positron collider, should produce only a Higgs and another particle called a Z boson. This makes it more suitable for detailed study of the Higgs' properties. Dr Lockyer said there were currently discussions over a new electron-positron collider in China, and a linear collider that could function as a Higgs factory in Japan. Alternatively, it could be housed at Cern after the Large Hadron Collider comes to the end of its operating lifetime. The Higgs is interesting because it is the only fundamental "scalar" particle. This means it has a "spin" of zero. Spin is an intrinsic property of particles with applications in everyday life - such as in magnetic resonance imaging (MRI). "The Higgs is the first fundamental scalar that has ever been observed. And pretty much all physics beyond the Standard Model contains scalars," said Dr Lockyer. "So these scalars would mix with the Higgs - the question is how strongly. But what you're looking for is evidence of the Higgs mixing with other scalars. That would be a window into new physics." One proposed scheme for new physics, which is known as supersymmetry, posits a host of new particles accompanying those we know about from the Standard Model. However, the LHC has now excluded large swathes of "parameter space" where supersymmetric particles could be hiding. "When we look hard for something and don't find it, the more creative you have to get. Everybody believes there's something there, but what we're now starting to question is the scale of the new physics. At what energy does this new physics show up," said Dr Lockyer. 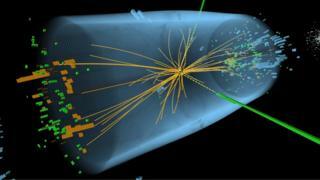 "From a simple calculation of the Higgs' mass, there has to be new science. We just can't give up on everything we know as an excuse for where we are now." He said physicists were now looking for less obvious signals of new physics and using tools such as machine-learning algorithms to help them find small deviations in the vast data produced by particle physics experiments. But he stressed that there was still plenty to come from the LHC, which will undergo a major upgrade in the 2020s. Fermilab, based in Batavia, Illinois, used to house the Tevatron - the most powerful particle accelerator in the world until the LHC came online in 2009. The Tevatron was switched off in 2011, but Fermilab is currently home to an exciting array of experiments that aim to push the frontiers of physics. One forthcoming project is Dune (Deep Underground Neutrino Experiment) which aims to unravel some of the mysteries of neutrinos, which are sometimes known as "ghost particles". Neutrinos have an intriguing property: they can switch (oscillate) between different forms, or "flavours". This so-called flavour-flipping might even hold the key to why the cosmos is dominated by matter, rather than its shadowy counterpart, antimatter. This remains one of the biggest mysteries in physics, since roughly equal amounts of each are hypothesised to have been produced in the Big Bang. "The primary science goal is to understand whether neutrinos and anti-neutrinos oscillate differently. That has a potential big impact on our understanding of the early Universe," said Dr Lockyer. "I am personally interested in observing neutrinos from a supernova that collapses into a neutron star or into a black hole. Those areas are of intense interest for many fields, as neutrinos play a role in producing heavy elements - such as gold - within a star." The Dune collaboration recently elected a new co-spokesperson, Prof Stefan Söldner-Rembold, who leads the particle physics group at the University of Manchester, UK. He recently told Symmetry magazine: "This is a formative period for Dune... what we decide now will shape the detectors and the way the collaboration works for the next 10 to 20 years." He added that it was important to attract young scientists to participate in Dune: "In order to create a vibrant and strong collaboration, we need to encourage the next generation of young physicists to be engaged with the project," he said. The experiment will involve beaming neutrinos from Fermilab in Illinois some 1,300km (800mi) underground to a massive detector instrument based at the Sanford Underground Research Facility in South Dakota. But before the full experiment comes online in the 2020s, test prototypes of the Dune neutrino detectors have been under construction at Cern in Europe. Each will be filled with 800 tonnes of liquid argon, kept at -184C. They are due to begin taking data in the Autumn.